This itinerary is a non-stop, action-packed Brazil experience where you come away truly feeling like a native. The majority of the activities are non your typical, run-of-the-mill tourist trap tours. Your experience with a local guide will be meaningful and s/he will really introduce you to the best of what Brazil has to offer. All hotels are located in the heart of the two cities, Rio & Salvador. This itinerary assumes an arrival into Rio on Wednesday morning. The trip can be started on anyday but activities may need to be moved as some are available on specific days of the week only. All packages include hotels in Salvador's Pelourinho neighborhood, which is the epicenter of all cultural activity in the city. For those travelers looking for a quieter experience, we can arrange accommodations in other neighborhoods. This itinerary does not include international or domestic flights, though we can certainly provide them to you. Wines and other alcoholic beverages during meals/except during tasting activities are not included, nor are tips for guides & drivers. Travel insurance is not included; please speak to your trip planner for a customized quote. Arrive in the Cidade Maravilhosa and enjoy your first morning getting settled or strolling the beach paths of Ipanema & Copacabana. In the afternoon you'll embark on a Food Tour of the city, exploring Rio's lesser known food scene in the neighborhoods far from the typical tourist traps. Munch on delicious street food, tasty bar snacks, amazing fruits and juices, weird Amazonian dishes, Brazilian beers and cocktails and plenty more. 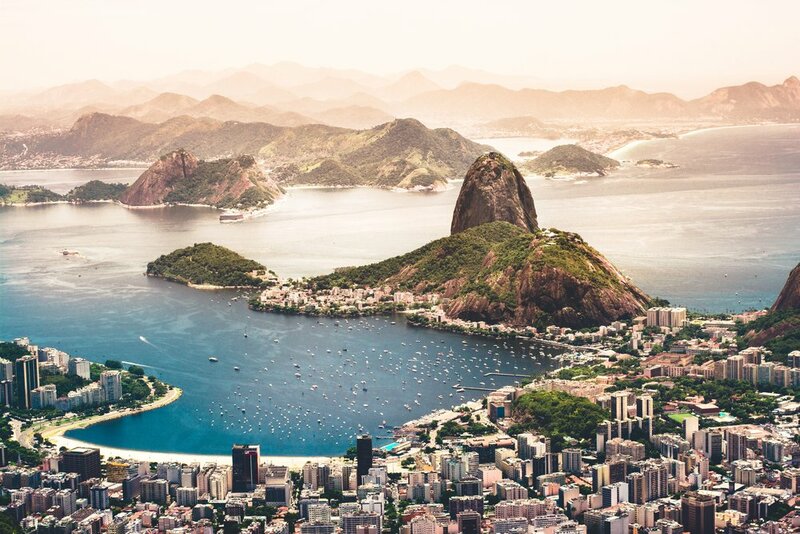 This tour isn’t just about eating – witness street art and other points of interest (including the Carioca Aqueduct and Selarón Steps), while hearing about the history of Rio and life in the city today. Get some insider tips on the best things to do in Rio! Return to your hotel and sip on a Caipirinha at the rooftop pool while you watch the sunset. After breakfast you'll depart the hotel heading toward the Cosme Velho neighborhood. From there you will board the train taking you up the beautiful mountainside before arriving at the feet of Christ the Redeemer, one of the seven “New Wonders of the World”, located 2,300ft above sea level. From here you'll head toward Santa Teresa, a traditional neighborhood located high upon the hills of the city, overlooking downtown and Guanabara Bay. Home to several Twentieth century mansions, cultural houses, galleries and gourmet restaurants, Santa Teresa’s charming cobbled streets are also a haven for local artists and intellectuals. Return to the hotel for some rest and then prepare for an evening out in Downtown Rio. There is no other place in the city that embodies the "alegria" or happiness of the Brazilian people more than the nightlife-centered neighborhood of Lapa. Once the sun goes down, this normally quiet neighborhood turns into a bustling and vibrant area full of restaurants, nightclubs and bars. The streets fill with cariocas and gringos alike, who flock to this Rio nightlife Mecca with one thing in mind: fun! From traditional northeastern forró to Rio’s own samba to reggae from Bahia, you'll enjoy the best that the Rio music scene has to offer. You'll go right to the heart of the action where our local guides will accompany you to one of the best clubs in Lapa, Rio Scenarium, a mix between an antique shop and an auction room, where locals come to listen to traditional Brazilian jazz and samba. Today is your day to enjoy the city at your own speed. Get some hours of sun in at the beach in front of your hotel, visit the Botannical Gardens or go for a shopping spree in one of Rio's countless fashion-forward city malls. If you're still looking for some more action, just let us know and we will arrange it for you! 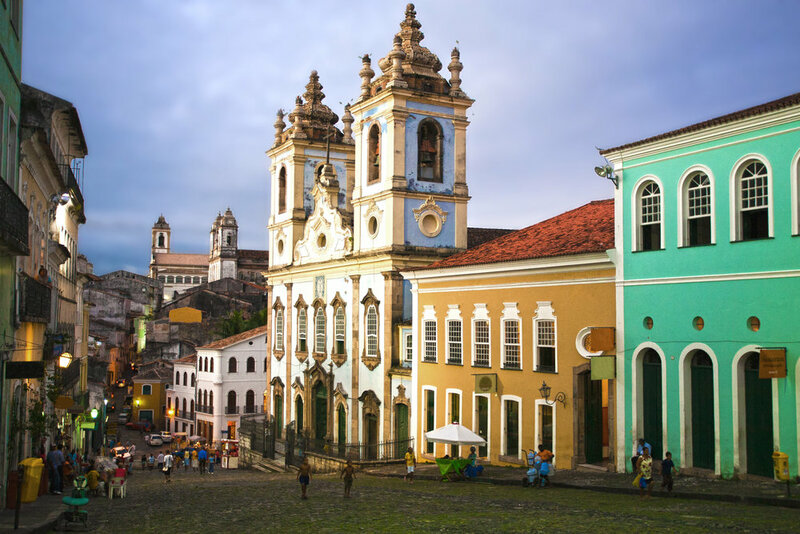 Say good bye to Rio as you head north to Salvador da Bahia, the country's first capital and its cultural epicenter. Get to know the city's most famous neighborhood, the Pelourinho, with an afternoon walking tour with your private guide. 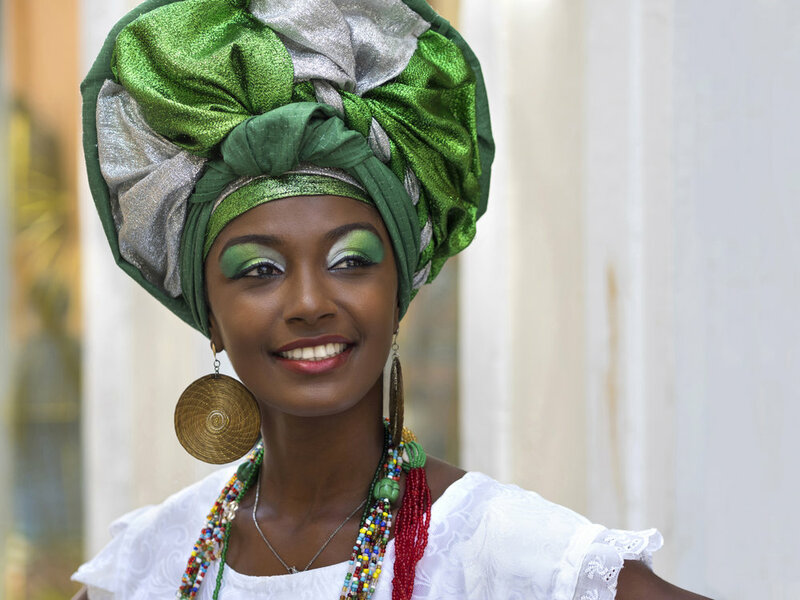 Here you will be introduced to the unique history and culture of Salvador, a city heavily influenced by Afro-Brazilian elements. Stick around afterward for dinner and drinks and wait for the Bahian nightlife to begin. To understand a city the best place to begin is in its local markets. Salvador is surrounded by the bay and ocean, and its fishermen protected by Yemanjá, the goddess of the sea. Fittingly, our tour focused on Bahia cuisine should begin in the recently refurbished Agua dos Meninos fish market, the city's main distribution center for all that comes from Yemanjá's domain. From here it is a short hop to the Sao Joaquim market, a traditionally vital trading link to the abundance of produce from the farming hinterland of the Reconcavo, and still the largest open air market in Brazil, a labyrinth of almost 800 stalls selling a myriad of goods; fruit, vegetables and spices, earthenware cooking utensils, wicker basketwork, medicinal and sacred herbs. You'll end with lunch at a local restaurant to try the main dishes of Bahian cuisine. After lunch, you'll discover the story of one of Brazil's most fascinating and historically significant traditions: capoeira. During the visit to a traditional Capoeira School, you will have the chance to meet Capoeira group leaders to learn about the sport, its history and philosophy. You can even try the instruments and the basic fight movements. Come back to the hotel for some R&R and then head out again to enjoy a night of (what else?!) music, dance and food. The Bahia Folklore Company (Balé Folclórico da Bahia) is one of the most respected folklore dance troupes in the world. The company performs in the intimate Miguel Santana Theatre in the Pelourinho in a stunning presentation of the multiple African traditions that heavily influence the Bahian culture. We will see the sacred dances of the Candomblé, puxada de rede, a song by fishermen in honor of Yemanjá, the goddess of the sea and maculelê. Following the show, you'll walk over to one of Salvador's most renowned restaurants, Uaua, for a mouth-watering dinner comprised of Bahia's most traditional cuisines. Early in the day you'll leave the city behind to explore the farm hinterland on the western side of the All Saints´ Bay. This is the land of sugar cane plantations, peaceful colonial towns and busy country markets, a day full of insight into the lifestlye of rural Brazil. You'll drive north out of the city and head westwards, stopping in the country market town of Santo Amaro, continuing the drive westwards through the rolling hills to Cachoeira, the jewel of the Bahian hinterland nestled deep in the valley of the Paraguaçu River. After lunch (not included), take a walking tour of the town, with opportunities to browse in some local wood carvers stores’. Cross to the western bank of the slow moving river and visit the Danemann Cultural Center where world class cigars are expertly rolled. This tour is truly a journey back in time to the Brazil of yesteryear. Enjoy some time back at the hotel to relax before heading out for a night on the town in the Rio Vermelho neighborhood. Rio Vermelho, referred to by Bahians as the “bairro boemio”, or the bohemian quarter, embraces the city’s bon vivants with open arms, and in many cases, open doors until the wee small hours of the morning. It is here that Bahians will head for on a night out. The neighborhood has a myriad of bars, restaurants and botecos (tapas-like bars), all key to the district’s charm. Bahian street food is famous throughout Brazil. The famed acarajé and abará, traditionally sold through the city by “baianas de acarajé” from their colorful stalls, washed down with a cool drink is a favorite pastime for locals. Rio Vermelho is home to three of the city’s most famous treasured baianas de acarajé. Music completes the bairro’s attractions with a number of bars providing the best in local live music in its many forms, traditional and contemporary. The first stop will be to savor the acarajé and a cool drink (first drink is on us!). Then move on to a busy boteco to taste some of the local delicacies and finally pop in to catch one of the music performances. After breakfast this morning, you will be taken to the international airport for your departure flight home.